Look in every home in the US and you’ll likely find a tube of toothpaste somewhere. It is one of the most ubiquitous products in America, but have you ever stopped to appreciate the true genius of the product? The earliest forms of the dental necessity have been traced back thousands of years. In a few paragraphs, we are going to attempt to sum up a few of the things that make toothpaste such a fascinating product. Toothpaste as we know it has only been around for 150 years or so, but humans have been using pastes and powders long before Crest and Colgate came along. In fact, toothpaste has a much richer history than most people might imagine. Some historians and anthropologists have traced “toothpaste” all the back to the ancient Egyptians, around 5000 B.C. It is believed that they used mixtures of powdered ox hooves, ashes, burnt eggshells, and pulverized pumice to whiten their teeth, remove debris, and freshen their breath. Other ancient societies were found to have used some sort of toothpaste. The ancient Romans and Greeks mixed crushed bones and oyster shells with vinegar to form an abrasive tooth cleaner. Albeit a far cry from today’s minty toothpastes, early concoctions contained barks, powdered charcoal, ginseng, herbal mints, and salts for flavoring and freshening breath. After the ancients there is a long gap in toothpaste history, until around the 18th and 19th centuries. It would be nice to fill you in on the details between millennia, but historians were busy studying empires, plagues, and whatnot. Prior to the 1850’s tooth powders dominated the oral hygiene market, gaining popularity throughout Britain in the 1800’s. Most were homemade mixtures, made up of a sodium bicarbonate base mixed with brick dust, crushed china, and powdered earthenware. Eventually, some commercial manufactures began selling tooth powder, en masse. The homemade powders were very abrasive, removing debris and surface stains but wreaking havoc on enamel and gums. The rise of commercial manufacturing and scientific innovation opened the door for companies to start producing toothpastes as you might think of them today. 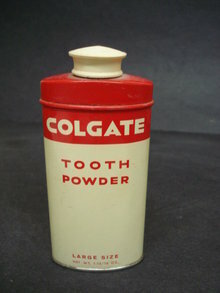 In 1873, Colgate began mass producing an actual paste, which was packaged and sold in a jar. Also in the 1870’s, a man named Dr. Washington Sheffield formulated a paste, which he called Dr. Sheffield’s Creme Dentirfice. Remember this name. Although Creme Dentirfice isn’t a household name, Dr. Sheffield plays a big role in a few years. Today you will find dozens of brands and types of toothpaste. Although most of them do the exact same thing, some emphasize their whitening effect or ability to alleviate tooth sensitivity. We take it for granted but toothpaste has come a long way. Toothpaste is a complex product that contains a lot of ingredients, all with unique purposes. Although many of these ingredients may be hard to pronounce, they offer outstanding oral health benefits. Abrasives: toothpaste does way more than freshen your breath. It helps remove debris and surface stains using mild abrasives. Today, you’ll now find ingredients like calcium carbonate and hydrated aluminum oxides that gently scrape plaque and buildup from your teeth’s’ surface. Fluoride: It’s in your water, mouthwashes, and definitely your toothpaste. Fluoride helps strengthen enamel and remineralize tooth decay. The American Dental Association recognizes fluoride as an important component of good oral health and puts their seal on all certified fluoridated toothpastes. Detergents: We’re not talking about laundry or dish soap, here. We are referring to the compounds that create the foaming action while brushing. The most common of these, sodium lauryl sulfate, binds with debris to carry it away from your teeth. Fluoride first made its way into toothpaste in 1914. By comparison, fluoridation of major public water supplies did not begin until the early 1950’s. Fluoride is an integral part of your oral health. Often studied, fluoride has been shown to strengthen enamel, reduce the chance of dental caries, and remineralize spots of decay. These benefits are the reasons you will find fluoride in your tap water, mouthwash, and toothpaste. Although widely studied, fluoride still has many skeptics. A quick google search of “fluoride conspiracy theories” will yield results about Communist plots in the 1950’s and governmental mind control. It’s quite entertaining. The most ingenious yet often overlooked aspect of toothpaste is the tube. We can all remember getting every last bit of toothpaste by rolling the tube as tightly as possible, but toothpaste wasn’t always packaged so nicely. As we mentioned before, in 1873 Colgate began selling large quantities of toothpaste in jars. Most of the other toothpaste manufacturers followed suit, selling family sized jars of product. This meant whole families used the same jar, dipping their individual toothbrushes into a minty community bacteria pool. Although not a major health hazard of the time, this practice was unsanitary, messy, and in need of revision. In comes Dr. Washington Sheffield. For years after developing Creme Dentrifice, Sheffield sold the dental cream in jars and did alright. Then, in 1892, Dr. Sheffield changed the game forever by introducing America’s first toothpaste sold in a collapsible metal tube. Inspired by French artists using similar tubes to store paint, Dr. Sheffield saw an opportunity to sell more of his already popular Creme Dentrifice. Nowadays, almost every toothpaste you see in a store comes in a collapsible metal tube. You will also still find every kid in America squeezing from the middle! We can’t accurately tell the history of toothpaste without talking about whitening toothpastes. Whitening toothpastes are pushed hard these days, assuring consumers that bright white teeth will guarantee more dates, better jobs, and happier lives. Whitening toothpastes contain several ingredients that help whiten smiles, or at least give a whitening effect. Hydrogen Peroxide: often used in whitening mouthwashes and strips, hydrogen peroxide can be found in some whitening toothpastes, only in much smaller quantities. It helps remove surface stains and physically whiten teeth. Blue Covarine: blue covarine is not as well-known as hydrogen peroxide but still provides a whitening effect. The chemical actually binds to teeth giving the appearance of whitening. Although blue covarine doesn’t physically whiten teeth, it gives a nice whitening effect that my find satisfactory. We often overlook some of the more amazing yet routine things in life. Although toothpaste isn’t as flashy as the automobile or air travel, it is something we’ve grown accustomed to without appreciating the benefits it provides. Next time you get ready for bed (and no one is around) tell your toothpaste “thank you” and stop to enjoy all of it’s foamy, minty greatness! If you liked this story or would like to hear about another topic, let us know in the comments. Be sure to share this and our other great posts, to let us know how much you enjoyed it!